Here's a small hollow skull including a colored brain made of Ninjaflex filament kept together with a screw. 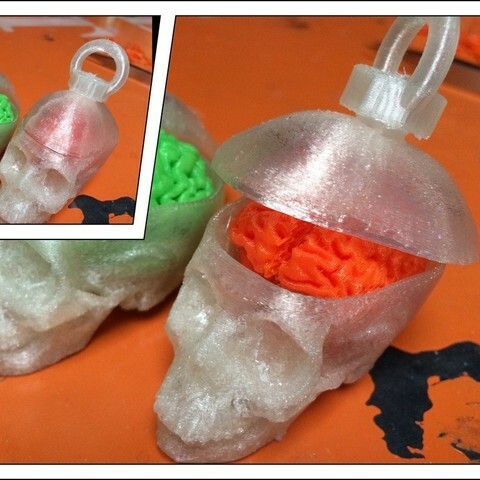 Find here the 2 stl files including the brain that I printed using Ninjaflex filament (225°C degrees and speeds 30 mm/sec and 90 mm/sec for traveling), and the skull (with the screw) printed on transparent PLA (temperature 230°C, speeds 90mm/s and 150 mm/sec, 2 layers, 0.2 mm, 10% infill). A little sanding on the holes will make the screw fit perfectly in. I would maybe increase the infilling for the screw to 30-40%. Disclaimer: I used some remixing from models provided here on Thingiverse but I don't remember which ones.